The Azorean Noctule Bat largely resembles Leisler's bat, with the exception of its smaller size and near-black face and ears. Although this species favours natural habitats for both hunting and roosting (e.g. cliffs, tree holes), urban expansion has led it to readily hunt around street lamps and roost in cracks and cavities in buildings. 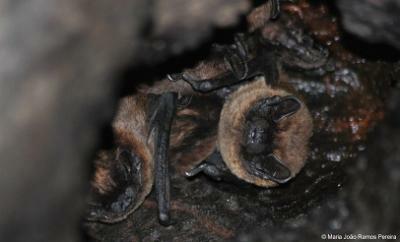 Compared to other Nyctalus species, N. azoreum is a more diurnal bat and frequently hunts in the afternoon. IUCN Redlist indicates that the populations of N. azoreum are decreasing. As the name indicates, this is an endemic species of the Azores. It has been recorded on all islands except Flores and Corvo. Human persecution, and the destruction of roost sites, are likely to be the main threats. Habitat loss and degradation, use of pesticides, and the spread of exotic plant species may also have a detrimental effect on the species.